Taking their name from the location of their corporate headquarters in Bern, Switzerland, Bernafon hearing aids have quickly risen to be an industry leader focused on developing and marketing devices that replicate sound as authentically as possible. Bernafon can trace its history back to 1924 with the establishment of Gfeller AG, who developed and manufactured Switzerland’s first hearing instrument in 1946. 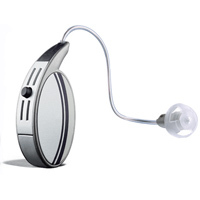 1986 – Gfeller takes over control of Maico Inc., a well known hearing device manufacturer in Minneapolis, Minnesota. 1986 – A merger with Autophon in followed by integration into the Ascom Group. While their products were available in Canada for many years, Bernafon established a solid presence here in 2000 with the takeover of Canadian hearing instrument company, Dahlberg Sciences Ltd., of Kitchener, Ontario. Every Bernafon product line is now available in Canada, including: Chronos, Vérité, Inizia, Veras, Move, Xtreme, Prio, Neo and Win. In a word: Quality. As part of their commitment to help people hear sounds authentically and communicate comfortably, the company focuses on complying with and exceeding international industry standards and regulations. The company is ISO9001 and ISO13485 certified in Europe and all its products comply with Europe’s Medical Device Directive, which has earned them the right to carry the CE marking. Other compliances include meeting the regulations of the Food & Drug Administration in the United States and the Therapeutic Goods Administration (TGA) in Australia. Quality engineering has also produced a number of convenience features that wearers enjoy, including remote control products, wireless connectivity and the comfort of near invisibility. Find the right Bernafon hearing aids for your needs, call Bravo Hearing Centre today at 416-207-9711 or contact us.